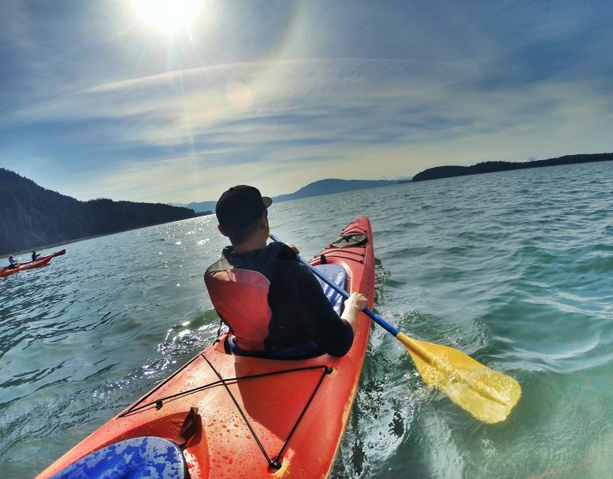 Learn to handle a kayak from an expert, then put your new skills to use with an unforgettable seaborne adventure! Glide through the waters native-style, get up-close looks at wildlife and enjoy ever changing views of the Mendenhall Glacier. Start with a narrated tour through a historic part of Juneau on your way to Douglas Island. Don protective rain gear, boots and life jackets, and learn the paddling techniques you'll need to handle your kayak. Then join a friend or new traveling companion in your two-person craft and you're off to explore! Against a backdrop of forested slopes, nearby peaks and the spectacular Mendenhall, you're on course for an informative and memorable tour of Fritz Cove. In small groups of six kayaks, you're able to stealthily approach wildlife. Bald eagles and their nests, herons, shorebirds and waterfowl are all common sights. Porpoises and even humpback whales occasionally surface for air. If you're lucky, you might see a humpback's enormous tail fluke. You'll also visit the Mendenhall Wetlands, a protected habitat teeming with more than 140 species of birds, nearly a dozen different mammals, and an abundance of marine life. Along the way, your guide will satisfy your curiosity about local flora and fauna, and explain the history behind landmarks such as Smuggler's Cove. But you'll get a sense for the experience that greeted the Aleut Indians as they traveled these waters two centuries ago. Souvenir T-shirts are available for purchase at the conclusion of the tour. Child rates per child ages 6-10. Suitable for all ages 6 and above. No prior experience necessary, just good health and an adventurous spirit. We encourage participants to bring apparel appropriate for outdoor activities. Children must weigh at least 40 pounds in order to fit into required life jackets. Children 6 through 12 must be accompanied by an adult. Children ages 13-17 must have a signed parental consent form to participate in the absence of a parent or guardian. Some final notes: bring your vouchers and dress comfortably for the weather (if your tour is on the water it will be about 10 degrees cooler.) Camera and binoculars are suggested for land-based tours. However, while on tours involving rafts, canoes and kayaks, we suggest you bring disposable cameras.